On Goshen Branch, which feeds into Great Seneca Creek. 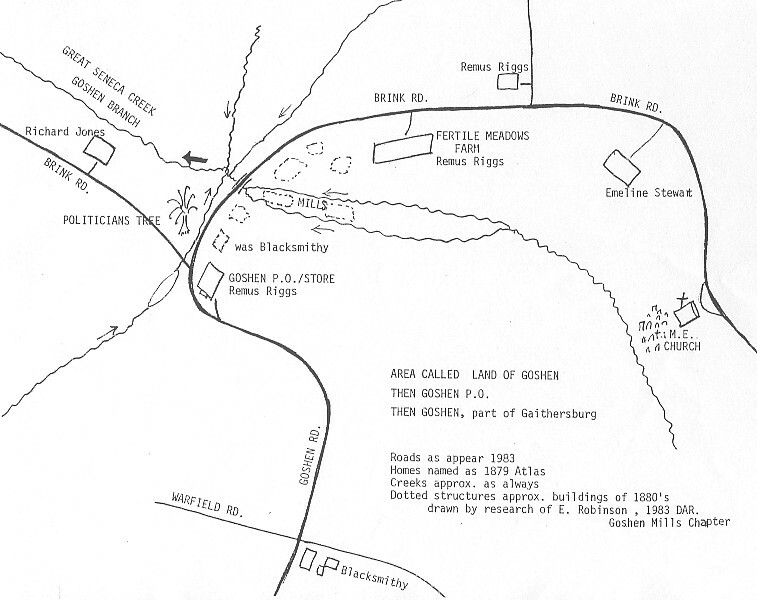 There were two mills which were located where Brink Road crosses Goshen Branch. They were located on the right side of Brink Road, heading north. The mills were located between the two streams which had split upstream and rejoined at the Brink Road bridge. Their location was described as in a grove of trees in the meadow. The two streams were used to drive the mill race. The mills used a turbine wheel. No trace of the mills may be seen and only a single stream exists today. The bricks from the three story mills have all been removed for reuse. Ignatius Pigman, Edward Crow, Samuel Robertson 3rd, George Washington Riggs, Remus Dorsey Riggs. Sometime after 1737, the Pigman family bought land and started two mills. The 1783 tax assessment showed the mill existed. Hoshua Pigman sold part of his holdings to his brother, Reverend Ignatius Pigman. In 1794, the mills were referred to as Crow's Mill. On Jan. 1, 1795 an ad for the mills appeared in the Maryland Journal "the millseat has 36 feet head and fall which is so calculated as to use the water a second time; there being two mill-houses, one above the other, viz. a brick house three stories high, 36 feet by 25 feet almost new, the other a framed house 24 feet square, the whole intended to work four pair of stones, three of which are now running, (two burrs, the other cullens). There is also materials for a saw-mill, which might be set to work with a trifling expense." In 1802 Edward Crow advertised "these mills stand on a never failing stream possessing of the peculiar advantage 36 feet fall, so as to work the water twice. First, the upper part of the seat is occupied by a merchant mill, the house of which is brick, three story high, two water wheels, 16 feet diameter, 2 pair of French Burrs, all in good order for the manufacture of wheat. Second, below this Mill stands a country Mill, the house there of three story, one of stone, the other two framed, 1 Water Wheel, 1 pair Cullins, and every thing in order for country work, of which it has a constant supply. This mill is calculated as to receive the united force of water from the Merchant Mill and a Saw Mill, which is also in good order. In 1803 Edward Crow sold the mills to Sam Robertson (d. about 1815). On July 24, 1817, George Washington Riggs purchased the mills from the Robertson estate for $13,115. (G. W. Riggs' brother, Elijah, founded Riggs Bank). In 1820, Remus Riggs ran the mills. In 1829 and 1835, Basal Magill purchased the property from G. W. Riggs. Later his son, Lloyd Magill owned the mills. He sold them on May 3, 1851 to his brother-in-law, Michael L. Peugh (Pugh). The 1850 survey listed the following: a brick merchant mill three stories tall to mill wheat to flour for sale; a frame country mill to grind corn and buckwheat for farmers; an open saw mill; and other property. In 1859, Remus D. Riggs inherited the Goshen mills. The Riggs family held this property until 1916. There was a destructive flood in Montgomery County in 1868 that damaged or destroyed most of the existing mills. Because one of the Goshen mills was built of brick, it survived. This great mill was said to have a turbine wheel and 42" stones all bound in iron. On August 27, 1890, a fire destroyed the mills and the miller's house. By the late 1800's more modern steam mills were in operation. If the fire (arson?) had not destroyed them, they would have probably closed down anyway. No trace of the mills may be seen. The bricks from the three story mill have all be removed for reuse. The following were millers (not owners) there: 1860 to 1879 John Davis, 1880 Charles T. Edmonston, 1890 G.W. Moxley.